Celtic Set To Act On Fan Misbehaviour Before The Issue Is Taken Out Of Our Hands. Last night there was a meeting at Celtic Park between supporter’s club members and some of the senior staff at the club; Peter Lawwell, John Paul Taylor and Ronnie Hawthorn, our head of security. It was in response to a growing number of incidents involving our fans. Whilst noting that there are problems at other clubs too, Celtic is concerned with the behaviour of our own supporters and the club has been preparing to act on that for a while, as this site has previously said. The throwing of a banger onto the pitch at Love Street accelerated a process that was already well underway. It cemented a growing conviction within Celtic that our club must act to curb these incidents before the issue is taken out of our hands. Before I start, I have to say that the club is not blaming any one supporter organisation for these things. Those who are quick to jump on The Green Brigade for every little thing have to be aware that they are not always at fault. Indeed, the club has established that the incident at Love Street had nothing all to do with our most famous fan group. But their predilection for bringing flares and other pyrotechnics into the ground is still causing concern, and it was one of the topics covered last night, along with some of the other incidents, and the Love Street one in particular. One subject came up which I think is worth talking about; the tendency for away fans not to sit in their seats. At away games lately, everyone stands, which isn’t just uncomfortable in a seated environment but might actually be dangerous as it prevents people moving back and forth in the rows. It also means that it’s difficult to tell who’s supposed to be sitting where, something that makes it occasionally hard to identify culprits when incidents occur. This is one of the areas the club is especially concerned about. To solve it, one of the proposed solutions is for the club to take its own stewards to away games, as was custom and practice in the past, but this has been complicated by the fact that several clubs have refused to allow this. Tighter controls on who gets away tickets have been mooted as well, but this would be completely negated if people were still wandering freely. Hearts announced yesterday that they would shut an entire section of their own ground for the last two games of the season; Celtic closed the standing section at the start of this one. This is something they won’t rule out repeating in future if the situation demands it. Hearts apologised for the inconvenience to fans who did nothing wrong; Celtic is monitoring that situation closely. They may well have to consider something similar. A lot of interesting suggestions were made, such as an extended use of firework sniffing dogs and better policing outside the stadium. I know a lot of the delegates were concerned by recent Police Scotland statements, which they see as passing the buck. But more “defence in depth” – the extending of the police line beyond the current parameters – combined with a rigorous searching regimen as well as the dogs, might stop this problem even getting near grounds. The fact is, Police Scotland hasn’t done enough about these things. They complain about stewarding and how they don’t want to be policing football grounds. Yet how many of their members would turn down the overtime? Not many, as we all know well. If they believe trouble has originated in a certain part of the stands there’s nothing to stop them, and stewards, from putting a ring around that area and at full time detaining those in it until everyone’s been ID’d. There are a lot of things they could be doing better; instead they want to pass the buck to the clubs. The key thing here is supporter safety, and to that end we can expect a campaign to raise awareness about the dangers of pyrotechnics in enclosed spaces. I mentioned UEFA’s report in an earlier article; expect that to be a key component in the campaign to come. 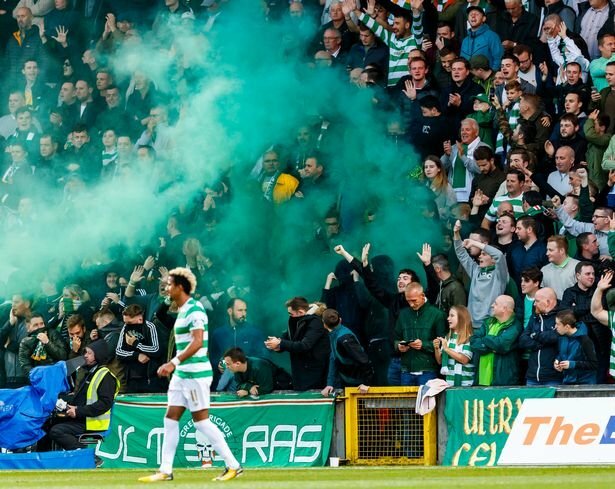 It is beyond dispute that flares and smoke bombs present a danger to nearby fans; anyone who denies it is simply not being honest, either with other Celtic fans or themselves. Celtic wants these practices to stop. They are serious. The awareness raising is only the first step towards doing it. If that fails, then they will get tough and nobody should doubt their resolve. The club will not be held accountable when a serious accident injures someone. They will not have the ground’s safety certificate put at risk for any reason. If it means shutting sections of stands they will do it. If it means bringing in additional stewards and telling them to crack down, then they will. If it means more gates outside the ground, and long delays whilst people are searched, if it means sniffer dogs then Celtic will do whatever it takes. Today Neil has backed Hearts’ tough stance; this is a sure sign that our club favours the action the Edinburgh club has undertaken. Ann Budge will get a lot of credit for what she’s done, but actually Celtic has been contemplating serious action on these matters since the season began, and we were likely to ramp it up over the summer months anyway. Anyone who thinks we’ve been lax on this stuff hasn’t been paying attention; this site has warned of Celtic’s resolve on these matters time and again. At the heart of all of it is a fear – a very real fear – that if football doesn’t get its own house in order that the Scottish Government will. Celtic opposes Strict Liability whoever implements it. The SFA won’t be allowed that power for reasons that are all too obvious, and we’ve already seen what Holyrood intends to do; they seem more worried about re-imposing an illiberal ban on songs than they are about any of the more serious matters. Granted, there are exceptions; the much maligned John Dornan actually does care about eradicating sectarianism and anti-social behaviour. But there are others who simply want Offensive Behaviour At Football Act Part II, and they will use every incident in the stands to promote that cause. Celtic is gravely concerned about the way the political wind is blowing. Last night’s meeting broke up without any definite measures being agreed, but the club is determined to take forward the discussions from it and to form a policy from them. There will certainly be a well-co-ordinated campaign to educate fans about the dangers of flares, but what the club does beyond that will depend on the co-operation they get from Police Scotland and, of course, the fans. Drastic measures are no longer out of the question though.